Micropitting occurs on surface-hardened gears and is characterized by extremely small pits approximately 10 m (400 -inches) deep. Micropitted metal has a frosted or a gray appearance. This condition generally appears on rough surfaces and is exacerbated by use of low-viscosity lubricants. Slow-speed gears are also prone to micropitting due to thin lubricant films. Micropitting may be sporadic and may stop when good lubrication conditions are restored following run-in. Micropitting and Load Capacity of Gears: The micropitting load-carrying capacity of gears can be calculated according to ISO TR 15144-1, where the influence of lubricant, operating conditions, and surface roughness is considered with the specific lubricant film thickness. For this purpose, the specific lubricant film thickness of a practical gear is compared with a minimum required specific lubricant film thickness. 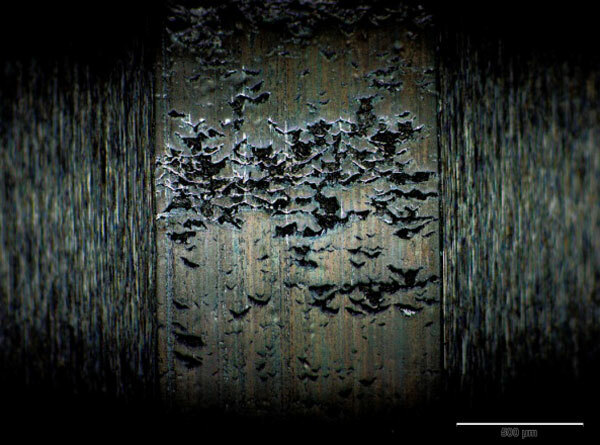 The latter is the specific film thickness where no micropitting risk is given for a lubricant and can be determined by performing a micropitting test according to FVA 54/7 . Standard Micropitting Test for Gears: The micropitting test according to FVA 54/7 consists of a load stage test and an endurance test. Test gears type C-GF run at a circumferential speed of 8.3 m/s and a lubricant temperature of 90°C or 60°C. The load and the test periods are varied. Use gears with smooth tooth surfaces produced by careful grinding or honing. Use the correct amount of cool, clean, and dry lubricant with the highest viscosity permissible for the application. Use high speeds, if possible. Use carburized steel with proper carbon content in the surface layers.